The DataHub QuickTrend feature allows you to build real-time trend charts of your data, by simply selecting the data you want to trend from the points available in the DataHub. You can have any number of lines in your trend, the only limit is CPU resources on the computer you are running on. You can zoom and pan to see your data in in more detail. When you add points to a trend, the QuickTrend program automatically configures the DataHub Historian feature to start storing history for those points. (not available in the free version). With histories being stored, you can scroll back days, months, years, to when the point history was first started. The trend display is receiving every point change from the DataHub, even though the actual trend update rate may be much slower than the data changes. This ensures you never miss important changes in your data that may be missed if the trending application was polling the data source. If you see something interesting in your trend chart, you can easily print the display by right clicking on the trend and choosing print. Once you have configured a trend with the points you want and any additional customization, you can save the settings as a named configuration. This allows you to build up a library of trend displays for different points within your system. 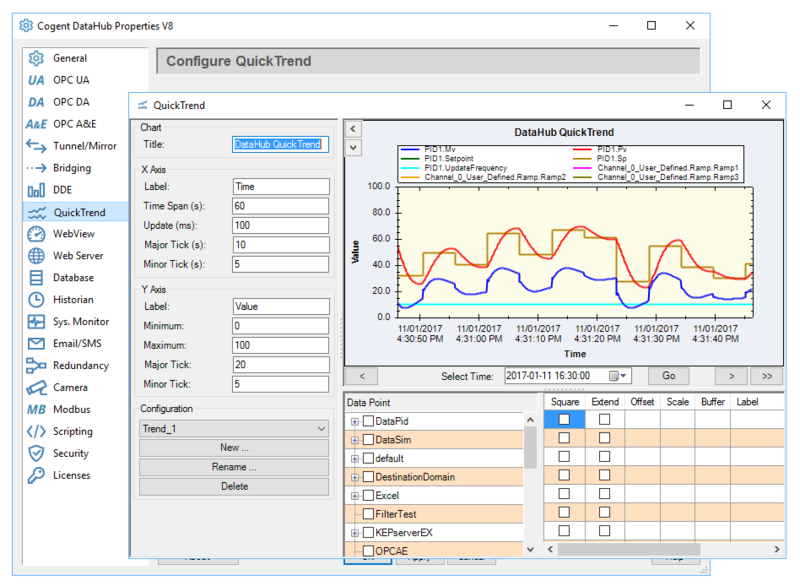 Once you’ve got the QuickTrend setup the way you want, you can drag the configuration panels out of the way to display the trend in the full window. QuickTrend is part of the DataHub Core, and is thus available in all Products.